Eugène Rouché was born in Sommières in southern France. This town, about 30 km from the south coast, is situated between Nimes and Montpellier and now contains a street named after the famous mathematician. His parents were Jean Jacques Rouché (1818-1861) and Marie Nicot (1807-1861). Jean Jacques Rouché was a tax collector and the family moved to Aniane in the Hérault district where Jean Jacques was employed. Rouché completed his schooling at the Sainte-Barbe College in Rue Valette in Paris. This school, founded in 1460, was designed to prepare students for sitting the entrance examinations for the École Polytechnique and the École Normale Supérieure. He attended the school at the same time as Gustave Eiffel (1832-1923), later famed as an engineer. In 1852, after success in the entrance examinations to the Grandes Écoles, Rouché entered the École Polytechnique. When he entered this university, his home address was in Aniane and his physical description is recorded as: light brown hair; low forehead; medium nose; red eyes; medium mouth; round chin; and rounded face. He was in the same class as Alfred de Billy (1832-1906) who became an Inspector of Finances, Fernand Raoul-Duval (1833-1892) who became a leading engineer, and François Chrétien Léon Hartung (1832-1908) who, after a military career, became governor of Verdun. Rouché graduated from the École Polytechnique in 1854 after two years of study. Several times I attended oral examinations by Mr Lefébure de Fourcy and this is my impression. The professor cannot be considered a benevolent reviewer, his voice is harsh, his tone is dismissive, also he questioned in a very firm stiff manner, and showed no mercy for any errors of logic. In 1858 Rouché was appointed as admissions examiner for the École Centrale in Paris, a position he held until 1877. He was appointed as a tutor for geometry and stereotomy for the École Polytechnique in 1861, continuing to hold this position for the next 22 years. Rouché married Suzanne Hélène Marie Bouzanquet on 11 December 1861 in Lunel, Hérault. Hélène Marie Bouzanquet had been born 26 September 1838 in Lunel. They had a son Louis Eugène Rouché (1862-1957) who was known as "Jacques". He became an Inspector of Finance, and Director of the National Academy of Music and Dance from 1914 to 1944. In 1867 Rouché was nominated professor of descriptive geometry and stereotomy at the École Centrale in Paris. He also acted as an examiner at the École Polytechnique from 1877 to 1883. In 1884 he was named professor holding the chair of descriptive geometry at the Conservatoire des Arts et Métiers in Paris. He continued to hold this position until he retired in 1905. Rouché published many mathematics articles, among them were some which appeared in Comptes Rendus and some in the Journal of the École Polytechnique. For example he published Mémoire sur la serie de Lagrange Ⓣ in the second of these two journals in 1862. In Comptes Rendus he published papers such as Sur la discussion des équations du premier degré Ⓣ (1875), Sur les lignes asymptotiques d'une surface du quatrième degré Ⓣ (1877), Sur un problème relatif à la durée du jeu Ⓣ (1888), and Sur la formule de Stirling Ⓣ (1890). The two-page paper Sur la discussion des equations du premier degré Ⓣ in volume 81 of Comptes Rendus of the Académie des Sciences contains his result on solving systems of linear equations. This is the well-known criterion which says that a system of linear equations has a solution if and only if the rank of the matrix of the associated homogeneous system is equal to the rank of the augumented matrix of the system. Rouché later published a fuller version of this theorem in 1880 in the Journal de l'École Polytechnique. In fact he was not the first to prove such a result and, after Rouché's paper appeared, Georges Fontené published a note in the Nouvelles Annales de Mathématiques claiming priority. When Georg Frobenius discussed this result in his papers, for example in Zur Theorie der linearen Gleichungen Ⓣ published in Crelle's Journal in 1905, he gave credit for proving the theorem to both Rouché and Fontené. However it is now often called the Rouché-Frobenius theorem, especially in the Spanish speaking world. This is almost certainly because the Spanish/Argentinian mathematician Julio Rey Pastor referred to the theorem by this name. If f (z) and g(z) are two complex functions which are regular within and on a closed contour C, on which f (z) does not vanish and also |g(z)| < |f (z)| then f (z) and f (z) + g(z) have the same number of zeros within C.
Rouché also wrote several textbooks including Eléments d'algèbre à l'usage des candidats au baccalauréat és sciences et aux écoles spéciales Ⓣ (1857), Leçons nouvelles de trigonométrie rectiligne et sphérique Ⓣ (written jointly with L Lacour) (1857), Traité de géométrie élémentaire Ⓣ (written jointly with Charles de Comberousse) (1864-1866), Éléments de Statique Graphique Ⓣ (1889), Coupe des pierres: précédée des principes du trait de stéréotomie Ⓣ (written jointly with Charles Brisse) (1893), and Analyse infinitésimale à l'usage des ingénieurs Ⓣ (2 volumes) (1900-1902). This two volume work was the result of a collaboration with Lucien Lévy (1853-1912) who was the father of the well known mathematician Paul Lévy. Lucien Lévy taught mathematics at the Lycée Louis-le-Grand in Paris and, for 23 years, was an examiner at the École Polytechnique. There are two ways of writing a book intended for study: one can restrict oneself to the official syllabus and do not go outside the framework; or perhaps one can also, by strictly following these syllabuses in what they require to be compulsory, yet go beyond and try to complete them. In order to apply a science, it is not sufficient to know a few parts of it, rather it is necessary to be familiar with all its methods, to grasp the whole. The magnificent discoveries of modern geometry have not penetrated into teaching; abandoned by the official syllabuses, they do not occupy the place in the series of mathematical studies due to them; we speak of it only a little and incidentally in Analytical Geometry, where it seems to be wrong to replace the admirable ideas created by Descartes by new ideas. We are far from reproaching the syllabuses for their silence in this respect; they are so full that it would be unworthy to demand an addition. But can one not learn the syllabus required for an examination and try at the same time to understand the scope of the science that is being studied, by making with a quick study, an overview of its main methods? Such is the thought which guided us in the composition of this work. For a list of the contents of the 1900 edition of this work, which clearly exhibits the philosophy described by its authors in the above quote, see THIS LINK. Edmond Laguerre died in 1886 and Rouché became one of the editors to work on the production of his Collected Works. There were three editors for this work, the other two being Charles Hermite and Henri Poincaré. Oeuvres de Laguerre Tome I, Algèbre, calcul integral Ⓣ appeared in 1898 and Oeuvres de Laguerre Tome II, Géométrie Ⓣ was published in 1905. 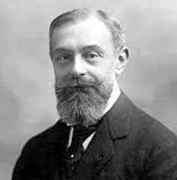 Rouché was a member of the Société Mathématique de France, serving as its president in 1883-84. He was also a member of the Société philomathique in Paris and a member of the Conseil supérieur de l'enseignement technique. He was elected to the Academy of Sciences in 1896 and to the Académie des Sciences et Lettres de Montpellier. The town of Lunel where Rouché died is close to his birthplace of Sommières. In fact it is situated about halfway between Sommières and the southern coast of France.